Let us show you how window shutters can add charm and enjoyment to your Collingwood home or business. One of the best things about window shutters is that they go well with many different décor styles and also look great from the outside, increasing the overall charm and beauty of both. They add an element of sophistication that is not just decorative, but also quite functional. Here at Ashtons Blinds, we are proud to offer a wide variety of styles of window shutters. One of the benefits of window shutters is that they put you in complete control over how much light and/or privacy you desire at any given time. There are additional benefits, as well, depending on the style you choose. We are happy to share our 15+ years of experience with you, so you can make an informed decision about which window shutters will best serve your needs. The best part is, you can find out more about window shutters and see them for yourself in the comfort of your home with our free in-home consultation. We bring samples to you, so you can see how they operate, touch and feel their quality, and see them next to other components of the room to be able to choose the right texture, colour, and style to match your décor. We can also do a free consultation at your business, as window shutters make a great addition to offices and other businesses. Window shutters can add a lot to your property, including value. We are happy to discuss the process of ordering window shutters and having them expertly and professionally installed, so you can enjoy years of service from them. 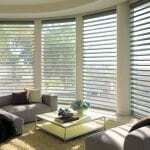 Contact us today to learn more and see if these amazing window treatments are the solution you’ve been hoping for.